It’s not often the TAB Highway stands head and shoulders above Group races when it comes to times but that was the case as Noble Boy confirmed his Country Championships credentials at Warwick Farm. There were four 1200m races on Saturday, the Group 3 Eskimo Prince, Group 2 Breeders’ Classic and the feature $2m Inglis Millennium – but Punters Intelligence data showed the Highway trumped them all on overall time. Noble Boy stopped the clock at 1:11.60; Castelvecchio (Millennium) 1:11.97; Champagne Cuddles (Breeders’) 1:21.11 and Gem Song (Eskimo Prince) 1:12.42. 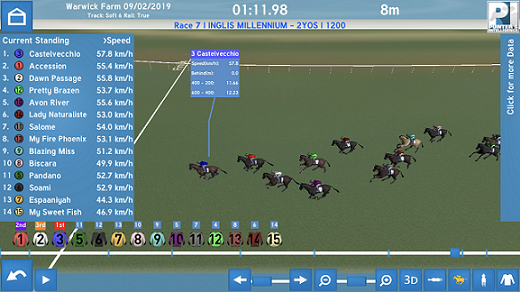 Although to the eye, with the bunched field, it didn’t appear the Highway was run so quickly the first 600m was run in 34.89, the Millennium in 34.94, the Eskimo in 36.38 and the Breeders in 36.49. The country horses felt the pinch a bit more in the second half of the race and while Noble Boy’s last 600m of 36.26 was easily the best in the Highway the winners of the other 1200m events all broke 36. Noble Boy is headed to the SERA Country Championships Qualifier (1400m) at Goulburn on March 2 as will the runner-up Acquittal and third placed Sausedge. Whether Acquittal can turn the tables on Noble Boy there remains to be seen but he did more work early than the winner by 0.24 seconds and was left a sitting shot. The hard luck story out of the Highway was Alternative Facts and his run looks better to the eye than the data will show, though he did close in the second best last 200m of 12.58 when he finally had a clear shot. Castelvecchio announced himself as a serious two-year-old with his second last-to-first victory from as many starts and his Inglis Millennium win was comprehensive. He covered more ground (+15m), was the only youngster to break 36 seconds home (35.90) and his last 200m of 12.01 was 0.39 superior to the field. Runner-up Accession ran the fastest 600m-400m of 12.19 but was no match for the winner as he could on produce a last 600m of 36.59. Given Castelvecchio is a half brother to Spring Champion Stakes winner Maid Of Heaven there’s scope for him to get over more ground and he has to be a force come the Group 1 Sires’ Produce and Champagne Stakes. Only two horses broke 35 seconds for their last 600m all day and real standout was Inglis Sprint winner Fiesta who ran a booming 34.63 in winning the $1m race. She clocked the fastest splits for three of the last four 200m sections as she ran down Estijaab. The Golden Slipper winner, first-up since that victory, had no answer but safely held the rest running 35.10 for her last 600m. The other horse to break 35 was Egyptian Symbol who ran fourth in the Breeders’ Classic, she came home in 34.92 running the fastest 600m-400m (11.81) and 400m-200m (11.23). The fastest last 200m in the Breeders’ went to Nettoyer (11.82). Don’t miss Punters Intelligence with Gerard Middleton, Brad Davidson and Brad Gray at 7pm Tuesay on Sky Thoroughbred Central. Click here to download the Punters Intelligence app.